Like Roseanne, Gerhard, well Gerhard kinda tries to be aggressive but comes off as silly. Dealing with him is like being savaged by Geoffrey Howe. Ethon, a mythical bird, fond of liver who has had an effect on the climate change debate by ridiculing Prometheus rather than savaging him. Ethon is a frequent flyer between Colorado and the Rabett Run, were he comments. The bird purchases carbon offset credits to cover his emission. But wait, as several have become aware, there is yet another strand to Gerhard Kramm's ligaments. He has been peppering arXiv with specials, including the latest one which continues the silliness that he attempted to perpetrate here. This is an amusing bunch of stuff. Let us take a brief look at #1. As Arthur Smith said, that is a 22 page comment on a 6 page note, so no, brief, maybe not be the right word, but the bunny can be efficient. First Kramm tries on the nonsense he raised at Rabett Run about Arthur Smith's definition of an effective emissivity. Kramm only wins in an echo chamber, at Rabett Run it got torn to shreds. This little bottom of the deck shuffle has appeared many times, but maybe it is a first for arXiv. We then meet a couple of old friends from G&T, the non-rotating Earth model: the back side is cold as hell and the front as warm. Of course Kramm neglects to point out that this pretty well is what happens on the moon and cannot happen on a rotating earth. BTW, #4 on Rahmstorf, et al , is another version of the same figurative swindle Kramm attempts in #1, except there he also neglects the effects of other forcings which were important in the 50s and 60s. As the figure to the left shows, the greenhouse gas forcing only became dominant ~1960. This sort of nonsense only works when no one is looking. Hey, I was thinking there's no such thing as bad publicity (and his title nicely repeats mine) but the moron mis-spelled my middle initial! Arrr! I need to learn more pirate for a truly appropriate response, I think. like many of physicists, mathematicians, atmospheric scientists etc. I commonly use the arXiv of the Cornell University for distributing manuscripts before they will be published. The paper of Hansen et al. (2008, http://arxiv.org/abs/0804.1126) entitled "Target atmospheric CO2: Where should humanity aim?" and the corresponding supporting material, for instance, appeared in arXiv long before it was published in The Open Atmospheric Science Journal (http://www.bentham.org/open/toascj/openaccess2.htm ). Gerhard Kramm, Fritz Herbert, 2006. Heuristic derivation of blackbody radiation laws using principles of dimensional analysis. J. Calcutta Math. Soc. 2 (2), 1-20. Gerhard Kramm, Ralph Dlugi, Michael Zelger, 2008. On the recognition of fundamental physical principles in recent atmospheric-environmental studies. J. Calcutta Math. Soc. 4 (1 & 2), 31-55. The Calcutta Mathematical Society established in 1909 is the oldest mathematical body of Asia. Its journals are evaluated, for instance, by MathSciNet of the American Mathematical Society. The manuscript "Planck's blackbody radiation law: Presentation in different domains and determination of the related dimensional constants", authored by Gerhard Kramm and Nicole Mölders, has been accepted for publication. The scope of this paper is education and science history. Since Arthur Smith's manuscript was only published in arXiv, my co-authors, Ralph Dlugi and Michael Zelger, and I had no other choice as to publish it even there. In contrast to you, I write manuscripts under my name. I do not use a pseudonym. It is not funny that people like you are acting like a sniper against scientists who do their jobs. However, "Was stoert's den Mond, wenn der Hund ihn anbellt?" let me quote you: "Kramm neglects to point out that this pretty well is what happens on the moon and cannot happen on a rotating earth." Are you kidding? The earth's moon is rotating, too. The moon's angular velocity is slower than that of the earth (roughly a factor of 28). However, it plays no role, when one rotation is considered as Arthur did. For your information: the figure you showed is copyright material. Please, cite it correctly. The fit of the CO_2 concentration is taken from Figure 4 of Kramm, Dlugi, and Zelger (2008). It can also be found under http://www.gi.alaska.edu/~kramm/climate/Figure_4.jpg . It is difficult to calculate a correlation coefficient because the direct observations (e.g., Mauna Loa) have, by far, a much higher degree of accuracy than the Siple ice core results. My comment on the paper of Rahmstorf et al. (2007) contains correlation coefficients for the Mauna Loa data and the HadCRUT3 data of the British Hadley Centre. This is an amusing bunch of stuff. Let us take a brief look at #1. As Arthur Smith said, that is a 22 page comment on a 6 page note, so no, brief, maybe not be the right word, but the bunny can be efficient. First Kramm tries on the nonsense he raised at Rabett Run about Arthur Smith's definition of an effective emissivity." If Arthur Smith would have fundamental knowledge in calculus it would not be necessary to write 22 pages to his note. Ooo good, more Futter for the bunnies. Gerhard darlin, as we pointed out in the comment on G&T, the moon rotates slowly enough, and the heat capacity of the surface is small enough (no water, or at least not enough to matter), and not having an atmosphere, that you can treat it as a non-rotating body for the purposes of estimation. Not the earth. Then again, any physicist would know that. "if Arthur Smith would have fundamental knowledge in calculus it would not be necessary to write 22 pages"
In my younger days, I was quite skilled at competing in mathematics competitions - for instance, the Putnam, which tends to be quite calculus intensive, where one year I placed 12th in North America. My undergraduate degree was joint in physics and mathematics, having taken courses throughout the undergraduate mathematics curriculum, and a few at the graduate level. Of course it's hard to get a PhD in physics without some pretty heavy mathematics training - ODE's, PDE's, variational calculus, analytical geometry, complex analysis etc. But go ahead, continue to make a fool of yourself - you do your own side as much a disservice in this as our dear peer Mr. Monckton. Only, if I could ask one thing, could you at least *fix the error in the title*!!! "the moon rotates slowly enough, and the heat capacity of the surface is small enough (no water, or at least not enough to matter), and not having an atmosphere"
If one considers only one rotation, i.e., from 0 to 2 pi, the angular velocity plays no role. Especially in the case of a negligible heat inertia term (heat capacity times thickness of the water or soil layer under study), the amount of the angular velocity is unimportant. However, I recognize that you are too old to learn new stuff. Therefore, I stop to try to convince you. It is impossible. MOre entertaining is the question of who has Kramm fooled into joining him in his crackpottery? Are they innocent victims? Was something slipped into their drink one evening or were they on the same "Polish up your denialism" correspondence course? I am of course purely interested in the sociological interest of how denialism spreads. Kramm likes to swagger with the name of Akasofu, who appeared to his eternal discredit in the Great Global Warming Swindle swindle. As I have pointed out before, Kramm thinks it's some sort of show-stopper to point out that Akasofu was a protege of Sidney Chapman. Meanwhile, Kramm raves and slanders James Hansen, who was a protege of Van Allen. I am as fond of Sidney Chapman's reputation as the next University of Alaska science alumnus, but this is a bit much. I also will post what I always post, which is that Kramm represents himself and other rabid politicizers of science, but not the general attitude of the U of Ak, Fairbanks, or its West Ridge science complex :) Ask them sometime and find out! Ore entertaining is the question of who has Kramm fooled into joining him in his crackpottery? " Why would Kramm say "roughly 28" if "roughly 27" is closer to the truth? It's a mystery that only kramm can explain. So, in the case of the moon's rotation period, one should specify the period to the integer that is nearest to 27.321, which is 27, of course. Why would Kramm say 28 if the nearest integer is 27 unless he actually believed that the rotation period was closer to 28 than to 27? Incidentally, if the rotation period were actually 28 days instead of about 27.3, the moon's rotation period and orbital period would not be the same and we would not always see the same side. But then again, I probably did not need to tell anyone here that (except Kramm, of course). Lots of school kids know that. Just to provide an independent assessment on what Arthur knows in regards to calculus, Arthur and I were grad students together and I recall that one of our fellow grad students referred to Arthur as "the most powerful integrating machine known to man". He was basically the go-to guy if you wanted to do a nasty integral analytically (and didn't want to wade through, or couldn't find it in, Gradshteyn and Ryzhik). And, this was at one of the top physics grad schools in the country where there was no severe shortage of mathematical ability. Hence, I find it particularly amusing that Kramm accuses him of not having a fundamental knowledge of calculus! Just out of curiosity, Dr. Kramm, where are you these days in your own overall opinion of G&T? Do you still believe that the atmospheric greenhouse effect violates the Second Law as they claim? Do you believe that the 33 C estimate for the magnitude of the natural greenhouse effect is "a meaningless number calculated wrongly"? Or do you just prefer to debate the best ways to define things in order to avoid directly having to defend the drivel that is G&T's contribution to the literature? The psychology of the crank is weird. Kramm probably does know calculus, but seems to descend into stupidity when looking at straightforward and correct calculus used by Arthur. The arxiv paper is staggering for its ineptitude. It starts out with the usual solid angle red herring. A surface integral can be done with a solid angle, or by integrating over the surface directly. It's high school stuff to manage the change of variable and comprehend the same equations expressed in either form. Kramm can't manage it, not even after we walked him through surface integrals at this blog just recently. There's a new error by Kramm in this arxiv paper. On page 6 Kramm claims a "unit error" in Arthur's conventional surface integral. Just like every single time in one of these purported errors -- the mistake is trivial and ALWAYS due to Kramm. Since the position vector has the physical unit of a length, it is obvious that Smith’s equations (3), (6) to (8), and (11) are flawed by dimensional inaccuracies. The left-hand side of Smith’s Eq. (7) listed here as (2.4), for instance, demands K^4 . Whereas the right-hand side of that equations offers K^4 m^-1.What Kramm has done is take the dx of a surface integral and give it units of length! Here's the equation (2.4), which is Kramm's attempt at reproducing Arthur's (7). The "x" here represents a location on the surface of a planet, and this is a surface integral over small increments of surface dx, and so dx of course has units m^2. Kramm gets the wrong units by treating dx as a linear value, which makes no sense whatsoever. Nothing in Arthur's paper suggests anything so idiotic – it's a basic failure of Kramm AGAIN to read a perfectly straightforward surface integral. And of course, we get a repeat of the same errors Kramm made here previously. Arthur states – correctly – that effective temperature and effective emissivity can be defined as averages, and goes on to give explicit forumulae. Kramm cannot seem to grasp that an average might actually be a weighted average; which is of course precisely what is used to defined effective emissivity. It is the average emissivity, obtained using T^4 as the weight. The physical basis of this is plain. The nature of it as a weighted average is obvious. But can Kramm manage this? Not on your life! He goes on to show that Arthur's definition is not the same as a simple unweighted average (duh!) and then calls this an "error". Kramm can't possibly be this incompetent in his usual work. One could understand, perhaps, careless reading. But Kramm has had most of this explained already at length, and it's such very elementary maths. I don't understand how his head doesn't explode effort of maintaining this charade. I just waded through Section 5 of Kramm's paper and it continues a sort of strange style of argumentation that I think one sees also in G&T and also in the paper about no global temperature by Essex and McKitrick. It is a style where the mathematical calculations seem to be basically correct but the conclusions are just bizarre and don't follow from the calculations. For example, what Kramm essentially shows in Section 5 of his paper is that depending on how absorbing the atmosphere (and the earth) is to IR radiation, you can get various different temperatures above 255 K for the earth's surface temperature. This is, of course, the correct and not unsurprising result that is in no way in contradiction with what Arthur says in his paper: "A more realistic atmosphere would be characterized by more than one absorbing layer (or a thick layer with a temperature differential and limited conductivity from bottom to top), which will further decrease outgoing thermal radiation and increase surface temperatures. Details of absorption in the real atmosphere also depend on pressure; nevertheless, the presence of any absorption at all is what qualitatively distinguishes a greenhouse-effect planet from one with a transparent atmosphere, and is what allows surface temperatures to climb above the effective radiative limit." However, Kramm then goes on to conclude, "This means that this two-layer model of radiative equilibrium is unsuitable for explaining the so-called greenhouse effect. Additionally, we must be aware that this simple consideration does not include any well known strong wavelength and pressure dependency of emissivity and absorption. Smith’s attempt to refute the criticism of Gerlich and Tscheuschner on the so-called greenhouse effect is, therefore, rather fruitless." His second sentence correctly states a simplification of the model as applied to a real atmosphere...but, again, it is not clear who he is actually arguing against. And, his third sentence is a complete non-sequitor. The whole question that Kramm has chosen to make the centerpiece of that section has absolutely no bearing whatsoever on Arthur's criticism of G&T. There ought to be a name given to this style of argumentation given that it has begun to appear so frequently in the denialist literature. Anyone good at coming up with pithy lingo? D. Q. - I think your complaints illustrate another denialist style that seems to occur at least both in G&T and in Kramm's work that I had commented on previously (as Eli quotes in the post here): Namely, this idea of coming up with some (sometimes bizarre) interpretation of what the authors who they are attacking meant and then arguing against this strawman rather than trying to figure out a more interpretation of what they meant. It is so blatant that it certainly seems hard to believe that it is not intentional...or maybe there is just such a mental block they have that they will not allow their mind to come up with more rational interpretations of what the authors meant. Christ, is "knowing calculus" a low bar. This reminds me of David Kane and his l33t knowlej of statistix. It also reminds me of the late cult leader L. Ron Hubbard, who maintained till his dying day that all science was simply a matter of mastering, in his words, "jargon." can you agree that any location on a curved surface of a body like the earth is given by the position vector (Arthur denoted it as x, note that he used a bold symbol with which usually a vector or a tensor is characterized)? Can you agree that any arbitrary local quantity like the albedo is related to the location by the position vector (Arthur denoted it as a(x, t), where the time dependence is also expressed, but it plays no role in the integration)? Can you agree that the local zenith angle, Z, of the sun's center is also related to the location of the bright side of the earth by the position vector (Arthur denoted it as Z(x, t), where he used a Greek symbol instead of Z)? Can you agree that a(x) cos(Z(x, t) is called the integrand and a(x) cos(Z(x, t) dx is denoted as the differential of the integral in Arthur's eq. (3)? To claim that x is a surface element makes no sense because the surface is a scalar quantity. Only scalars can simply be added. In the case of vectors the rules of vector algebra and vector calculus have to considered. If, however, x is a scalar, then it is impossible to describe any location on a curved surface of a body with only one scalar. One still needs three coordinates. I still believe that Arthur's knowledge in calculus is above average. However, in math we cannot do what we want. Joel asks: "Or do you just prefer to debate the best ways to define things in order to avoid directly having to defend the drivel that is G&T's contribution to the literature?" Joel, I believe you just got your answer in Kramm's last comment. He completely skipped over your question to address a comment made by Duae after yours. I suspect that Kramm will not defend the gist of what T&G said (eg, about greenhouse effect violating the 2nd law of thermodynamics) because he knows he can't. And he also won't talk about the result that countless others have obtained for the global surface temperature (288K) because he knows he can't challenge that either. he can't challenge the greenhouse effect on the basis of physics, so he is left to play silly mathematical word games about the meaning of "is". Where are you these days in your own overall opinion of G&T? Do you still believe that the atmospheric greenhouse effect violates the Second Law as they claim?That being said, I continue to be amazed at the sheer incompetence Gerhard shows in following simple ideas in calculus. Gerhard asks me some questions about surface integrals in a comment at 5:33 pm. The questions betray fundamental confusion. In all seriousness your major stumbling block is recognizing just how very elementary it is. You've unfortunately committed yourself to identifying as an "error" a trivially correct surface integral. It's going to be much too embarrassing for you to ever admit you were wrong, I suspect, so you're cut yourself off from ever understanding any explanation. The short answer remains precisely as before: this is a surface integral, and so the "dx" for the 2 dimensional quantity x has units of area; you integrate over both dimensions in a surface integral. Arthur's paper does not use the "double integral" sign often used to denote a surface integral, but there should be no ambiguity. If you need a refresher in surface integrals then you could start with Surface Integral at Wolfram MathWorld. It's not a tutorial, since you already know calculus, but it may help you brush up some definitions and background. Arthur uses "x", consistently, to denote a location on the surface. In the Wolfram page, the variable "a" is used rather than "x"; in either case it is a two dimensional location on a surface, and can be given with two single dimensional co-ordinates "u" and "v". Arthur's equations all use the form of an integral "dx", where "x" is the 2D location quantity. The Wolfram page helps show how to put this into any co-ordinate system. The dx may be replaced with MOD(T_u cross T_v) du dv, where u and v are your preferred co-ordinates, T_u and T_v are the tangent vectors on the surface for these co-ordinates, and the magnitude of the cross product, with the du and dv, gives you an area. Arthur integrates various scalar values over the surface, and defines scalar values for a given time and surface location. Hence we have a(x,t) for albedo, and Z(x,t) for the local Zenith angle. (Arthur uses the Greek θ, or theta). The equation also uses S(t) for the solar constant, which is independent of location. The equation (3) to which Gerhard refers is for a total reflected energy for the Earth's surface. To claim that x is a surface element makes no sense because the surface is a scalar quantity. Only scalars can simply be added. In the case of vectors the rules of vector algebra and vector calculus have to considered.That's just ignorant. The "x" used here is always a location on a surface, and thus it is a two dimensional quantity, not a scalar. The "dx" is within a surface integral; you can also think of it as integrating over both dimensions. If you substitute for any two co-ordinates then the "dx" becomes a scalar magnitude of a cross product of tangent vectors, along with the "du dv" of the co-ordinates, and that has units of area. The Wolfram page shows you how this works. It is a basic definition you ought to know. Your claim of a unit error is a fundamental error in following a simple surface integral. Arthur's paper presumes a base level of competence here, and you need to pull your socks up. There paper does not include a tutorial in surface integrals for you, and it shouldn't have to. It's incredible that you still can't follow this. "And he also won't talk about the result that countless others have obtained for the global surface temperature (288K) because he knows he can't challenge that either." Please do me a favor and show me a statement in which I denied the value of 288 K. I think you will not find such a statement. I always use the data of the British Hadley Centre because I consider these data as trustworthy. If Eli Rabett had cited me correctly, it would be obvious that the diagram shown by Eli Rabett is based on the HADCRUT3 data. you are barking up the wrong tree. Eli Rabett's attack is directed against me, but not against Gerlich and Tscheuschner. This is typical for him. He uses a stupid pseudonym in slandering scientists who disagree with him. Unable to understand what the basics of atmospheric energetics are, he needs the support of people like you, Arthur and Duae. If one of them is criticized by someone then he always starts a fierce attack against the critic. However, I do not play Eli Rabett's game. Therefore, I will not blog any further comment here. Eli: Any correlation in your second graph, the one identified as "Climate Change Attribution", is heavily dependent on the very much outdated Hoyt and Schatten TSI reconstruction used by Meehl et al, the source for that graph. If you were to replace the Hoyt and Schatten TSI reconstruction with one that's up to date (Svalgaard or Preminger & Walton for example) your correlation disappears in the period prior to ~1940. Are you kidding? The earth's moon is rotating, too. The moon's angular velocity is slower than that of the earth (roughly a factor of 28). However, it plays no role, when one rotation is considered as Arthur did.The last sentence is wrong. Sorry for being so blunt, but Arthur is not considering just one rotation, but rather a periodic process, and you are denying a basic property of thermal waves. The response of a thermal system (e.g. surface with heat dissipation into a temperature reservoir, thermal conductivity, radiative losses) to periodic heating will in general depend on the frequency of the heating. The frequency will affect, amongst others, the amplitude of the thermal wave and the average temperature of the surface. A basic example of this would be a pot placed on an oven, which is turned on and off either twice a week or 20 times every second. In the former case the times spent heating up and cooling down the pot can be neglected with regard to the period of the heating and the temperature of the pot is either it's maximum or it's minimum temperature. In the latter case the frequency of heating is averaged out by the thermal inertia of the pot and the amplitude of the thermal wave can be neglected, i.e. the pot has a virtually constant temperature. It is this frequency dependence that Smith nicely demonstrates (with reasonable simplifications) in his arxiv manuscript, evidenced in equation 23, the definition of the lambda parameter and figure 1. Hi Bob Tisdale... yes the graph uses an unusual solar forcing. I think the point is that the vertical scales are meaningful. The choice of vertical scales in Kramm's graph, however, is entirely arbitrary. It's just two different curves plonked together. The scales used make the CO2 rise look strong while the temperature rise looks weak, and given Kramm's behaviour it is a safe bet that this is deliberate misdirection. Ι note you have an interest in the TSI stuff. I tend to agree with you that Lean 2000 is a bit out of date. Her own work has developed since then and she also now sees the TSI impact as weaker. But since the solar impact is small anyway, and the early part of the 20th century somewhat unclear, I don't think this has a huge impact. Models don't tend to capture the all the detail of the twentieth century, especially the hump around the 1940s. The early part of the century seems to have volcanic forcings as one of the most significant contributors in modelE, for example. Kramm says: "Please do me a favor and show me a statement in which I denied the value of 288 K. I think you will not find such a statement. I always use the data of the British Hadley Centre because I consider these data as trustworthy." Please do me a favor and show me a statement in which I claimed you had denied the value of 288 K.
In fact, that was precisely the point of what I said above. issue of global warming", and one can not support the claim that the "greenhouse effect violates the 2nd law of thermodynamics" without looking foolish. Whether kramm admits it or not, the main issue here is (are) the claims of T&G. That was the main impetus for Arthur Smith's paper. Rather that focus on substantive issues, Kramm chooses to argue about mathematical notation. Whether Arthur Smith's notation is standard or not is really completely beside the point. What is important is whether the average over the surface can be done and whether it is is meaningful. It can and has been done by many many scientists and they always get something close to 288K. And the global temp is meaningful as a gauge of the earth's overall energy balance (or in this case imbalance). "Therefore, I will not blog any further comment here." Looks like someone grabbed their marbles and went home crying to mommy. To return to the important point, Kramm and G&T represent what one might call the Pharisee School of Science. They are formularists (sic, Eli knows. . .). Real physicists are observers who examine nature and try and find the simplest set of principles that one can use to understand. These principles are then used to construct models from which one can mathematically describe the observations. There is a great benefit to simplifying the models and limiting the field of observation. If you are good at this the mathematics becomes simple. If you are really good it becomes elegant. If the system is complicated, it is usually the case that the model and mathematical description must also be complicated. While there are advantages to beginners of shutting up and calculating, understanding and calculating less is a goal that all should strive for. If one considers only one rotation, i.e., from 0 to 2 pi, the angular velocity plays no role.And if one doesn't worry about what's in the gas tank, the fuel level is irrelevant. Gerhard, the slower a planet rotates, the more it radiates only from the day side. THAT'S why the angular velocity matters. A planetary surface TAKES TIME TO COOL DOWN AT NIGHT. The shorter the nighttime, the less time to cool. Do you really not understand this? Especially in the case of a negligible heat inertia term (heat capacity times thickness of the water or soil layer under study), the amount of the angular velocity is unimportant.See above. I have to admit, I'd rather watch Natasha naked than read one of Kramm's papers. "I'd rather watch Natasha naked than read one of Kramm's papers. "I'd rather watch Bullwinkle naked than read one of Kramm's papers. As Eli points out, in order to be accurate, Kramm must show the total radiative forcing (sum of solar, GHG's, sulfates, volcanoes etc) because the temperature change is proportional to the total forcing change. 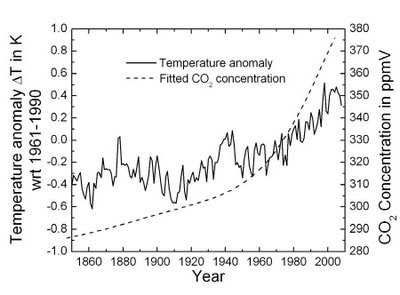 But what makes kramm's graph worse still is that it does not even show CO2 forcing, but simply CO2 concentration. Though there is no relationship between the scales on the two y-axes, it’s instructive to assume that there is a direct relationship and see what that means about climate sensitivity to CO2 doubling because it gives a general indication of how distorted (and misleading) the graph really is. The latter assumption would mean that temperature increases linearly with CO2 concentration and that a 100ppm change in CO2 should produce a 2C change in global temperature anomaly, which translates to a climate sensitivity to CO2 doubling of about 5.7C, nearly twice the 3C “best” value given by IPCC and well outside the “likely” range of 2 - 4.5C. It’s possible (though not particularly likely) that Kramm actually is not aware of the logarithmic relationship between temperature and CO2 concentration, but if he is aware of this relationship, why didn’t he at the very least show CO2 forcing rather than concentration on his graph? Kramm is either trying to fool undergrads, or he has dropped his standards for evidence because he likes the outcome of his analysis. Really, it seems as if some of the commenters here have put more thought into Kramm's work than he has himself. I don't exactly know why, but I really want to see him correct his errors - or at least mount some plausible defense of his misunderstanding, rather than bluster and fold completely. Kramm's formal position is "research associate". He does apparently teach courses, but only occasionally. His most recent course was on "Turbulence", in 2006. He did also teach a course on "Atmospheric Radiation" in 2004, which is a horrifying thought; but I expect most of it was fine technical details rather than a big picture. The first text listed for his atmospheric radiation course is excellent. "An Introduction to Atmospheric Radiation", by Kou-Nan Liou (2002). It explains very well all the same stuff that Kramm mangles so badly here. Professor Liou is active in research on climate modeling, greenhouse warming, remote sensing, and radiative transfer. He's an excellent antidote to Kramm's nonsense. In another of the posts in this blog (Reading Assignments blogged April 3, 2009), Kramm tried to snow readers by unspecific references to how all his critics ought to read up on assorted basic references. He invoked Liou's book -- and as always did so as confusingly as possible, with vague hints that the debate was between scientists like Liou and Kramm against the hoi polloi of the rest of us. I got hold of the book, and pointed out just how incompetent and hypocritical Kramm was being. That was the last comment to appear. You really want to start reading from Kramm's initial comment here, to the end. It's fairly short, and it’s an absolute train wreck. Kramm provides outlines for the four courses he has taught here. I presume that list is complete. I confess to a morbid curiosity about how someone who evidently can manage complex technicalities can make such a dreadful mess of comprehending straightforward material such as Arthur's paper, or indeed even simple mathematics of surface integrals. This kind of weirdness is not unheard of, but I do hope there's reasonable oversight provided for his teaching. Arthur I confess to a morbid curiosity about how someone who evidently can manage complex technicalities can make such a dreadful mess of comprehending straightforward material such as Arthur's paper, or indeed even simple mathematics of surface integrals.It's just my opinion, of course, but I'd have to say that it is most probably more than a matter of lack of comprehension. I don't believe that Kramm's graph above is misleading through some "accident of ignorance." For a non-scientist who has NO exposure to this stuff (and I mean NONE), ignorance of the above 3 might be plausible, but for an atmospheric scientist (someone with a PhD), such ignorance is simply not plausible, at least not to me. More to the point, Anon 7:00 AM, since people like Kramm have to follow the rules somewhat when actually publishing, it's likelier than not that you could find something in his actual published work - I'd start with the querulous "On the recognition of fundamental physical principles in recent atmospheric-environmental studies." - that contradicts the blather he posts in comments and blogs. I suspect that you are right marion. But I simply have no desire to wade through any more of Kramm's gibberish to find out. Which actually highlights an issue that kramm may not appreciate. Posting gibberish in a blog comment can have an impact on the way that you are viewed by the scientific community at large and perhaps even by editors of scientific journals. 1. There is no data for sulfate (tropospheric) aerosols before ~1970. Where does the pre-1970 data come form? Is it modeled? 2. Where does the pre-1970 volcanic (stratospheric aerosols) data come from? Is it modeled? 3. Where does the (obviously wrong) solar data come from? Is it modeled? From 1-3 we appear to have 3 sets of modeled data (one, at least, of which is definitely wrong) which somehow produce the desired modeled result. For the moment, let’s assume that the solar factor doesn’t make too much difference and press on. 4. GHGs and sulfate aerosols are reportedly produced by human/industrial activity. So the more human activity the greater the positive forcing from GHGs and the greater the negative forcing from sulfates. Up to ~1960 the proportion of GHG forcing and sulfate forcing appears to be roughly the same. After 1960, though, the GHG forcing is much greater by comparison. I can understand a modest divergence due to the supposed cumulative effect of GHGs but, since Mauna Loa observations began in 1958 the ratio of forcings changes dramatically. 5. I notice that the “lack of volcanoes” in the ~1930s was responsible for ~0.1 deg increase in global temperatures. What is the “lack of volcano” effect to-day, i.e. 18 years after the Pinatubo eruption. In fact what is the total aerosols (sulfate and volcanic) as the sulfate effect has been significantly reduced since ~1980. 6. Up until the early 1940s (observed) temperatures were rising at about 0.14 deg per decade (not too dissimilar to the last 30 years). Why? The temperature change between 1916 and 1945 is ~0.45 deg (see GISS). What caused it? GHGs and sulfates virtually offset each other. There’s no trend in ozone and there is also no solar trend (to repeat the solar reconstruction used is Wrong!!!). We appear to be left with the 1902 volcano (or lack of it) to explain almost half a degree of global warming between 1916 and 1945. The arctic warmed at about 4 times the rate of any other region on earth (See GISS zonal data). Was this due to lack of volcanoes? 7. Re: the 1916-45 warming. Why did it stop? What caused a strong warming trend to stop and go into reverse? Volcanoes?? even Pinatubo only caused a brief pause. Aerosols?? - not really - according to the diagram there was no change in aerosol trend. But the aerosol theory lives on …..
8. Why did the arctic warm at about 4 times the rate of any other region on earth (See GISS zonal data) and why did the arctic cool at 4 times the rate of any other region between the 1940s and 1970s. Can it be aerosols? 9. As mentioned earlier ghgs have a cumulative effect. Aerosols do not. Industrial aerosols are generally short-lived in the atmosphere. They are washed out by rain and snow. There is some dispersal, but it’s very thin. The effect of aerosols is REGIONAL. In the 1940s-1970s period, the regions in the NH mid-latitude bands should have been most affected by aerosol cooling. They weren’t. Why did the arctic cool 4 times as much as the NH mid-latitude regions. The IPCC Detection and Attribution studies are nonsense. They are simply an exercise in curve fitting where variables are included without any knowledge of their actual (and historic) forcings, and parameters are tweaked so that the resultant curve looks a bit like the observed data (I’ve done it myself). And, most ridiculously of all, ocean oscillations are not even considered. It’s a joke. There is one final question, though, i.e. 11. Is there any chance that Eli, RC, Tamino or any other pro-AGW blog will grasp the nettle and address the massive inconsistencies that are becoming increasingly evident in the “Climate Change Attribution” reconstructions. PPS: I've used the incorrect spellings of modelled (modeled) and sulphate (sulfate) to match the idiotic wordart diagram. the only thing that is idiotic is your gibberish above. I take it you are a Brit(wit), based on your insistence on "sulphate" as the only correct spelling. Also. according to Merriam Webster, either "modeled' or "modelled' is accepted as standard English. the only thing that is idiotic is your gibberish above. Never mind arguing over the spelling, tell me what's gibberish about the post. Is it the fact that the Arcrtic has dominated both warming and cooling in each of the 3 periods? Is it that the climatic effect of aerosols is "regionally specific"? Don't be shy tell me what I've got wrong. I'm always willing to learn. For some peculiar reason my google blog name has been changed to Oldngrumpy . Not to worry it's still appropriate. a sulfate (IUPAC-recommended spelling; also sulphate in British English "British English"?? what other sort of "English" is there? Where do you imagine the word "English" comes from? American English is slowly displacing British English, as you would have noticed if you were a bit younger and less grumpy. It is annoying, and I do my best for the rearguard action, but it is not helped by the default spelling for many Microsoft products being American English. As for Arctic warming, you always get more warming in the Arctic than the equator, the precise reason escapes me at this moment. Have you read any books or papers on this topic? The fact that the arctic warms and cools more than other regions (in response to changes in radiative forcing, for example) is due to feedback, specifically, that related to ice. For example, the melting of sea ice leads to less coverage, which lowers the reflectivity of the region leading to the absorption of more of the sun's energy, leading to more warming and less ice, etc. In addition, soot deposited on snow can also lead to more absorption and ice melting. The revere is also true. If temperatures drop (eg, due to volcanic activity), this leads to the formation of more ice and a higher reflectivity of the arctic region, which means less absorbed energy from the sun and further cooling. The IPCC Detection and Attribution studies ...are simply an exercise in curve fitting where variables are included without any knowledge of their actual (and historic) forcings, and parameters are tweaked so that the resultant curve looks a bit like the observed data"
I don't know where you got that idea but it is false. If you are genuinely interested in learning (and not just in calling graphs that are based on studies of which you are ignorant "idiotic"), I suggest you read the IPCC reports and the supporting studies in the peer reviewed literature because they explain how the various attributions are determined. If any idea is nonsense, it is that all the findings of climate science (the various radiative forcings, climate sensitivity, etc) are somehow determined by "tweaking adjustable parameters" on the models until the output fits the data. and PS : whether you like it or not, there ARE two primary versions of English (British and American) and American English has become dominant for obvious reasons. If Great Britain ever becomes a great power again (greater than America, that is), perhaps British English will regain its dominant position. I would not hold my breath. Explain how industrial (tropospheric) aerosols cooled the arctic between 1940 and 1970? Aerosols have a net warming effect in the arctic. For half the year the reflective properties of aerosols are redundant. What are they reflecting? If the feedbacks are so strong why did the 1916-1945 stop? You seem to believe it was due to an increase in aerosols. Where is the data for this phenomenal increase? As far as reading peer reviewed studies are concerned. I have read them and I've put the same questions to the authors. Why don't you read the papers. Read the ones referenced in the wiki arctic haze link. The ones which suggest significant warming at the arctic due to aerosols. Then read Shindell's recent paper which says part (up to 70%) of the recent arctic warming may be due to a reduction in aerosols. Get the arctic data from GISS. Plot it. Then have a good hard look at it. Look at the 'saw-tooth' shape of the graph, i.e. warming-cooling-warming. Feedback is it? Feedback from what? What caused the ~1915 warming? Start with that. Tell me what caused the early 20th century warming of 0.14 deg per decade. PS The word 'English' relates to the country England. "During 1976-2007, we estimate that aerosols contributed 1.09 +/- 0.81 C to the observed Arctic surface temperature increase of 1.48 +/- 0:28 C."Lots of discussion is available at realclimate, with a guest post by the author. Many of the questions you ask are answered in the the same papers you are citing; such as Shindell and Faluvegi (2009). Drew Shindell also has joined in a discussion to explain some of the details at realclimate. Some answers are more tentative than others. We don't have all the answers, but we do have some pretty solid discoveries that are a basis for progress. Aerosols are one aspect where we still have a long way to go. But some of the effects are now pretty definite. You ask how industrial (tropospheric) aerosols cooled the arctic between 1940 and 1970. Mainly, this is by increased reflection of sunlight. Aerosols come in many forms and have multiple effects. The major direct effect is is cooling, by reflecting and scattering sunlight. A further indirect cooling effect occurs when aerosols assist in cloud formation, and the clouds reflect sunlight. Some aerosols can also absorb sunlight (which cools the surface but warms the atmosphere) and some can darken ground cover for more absorption at the surface. This latter effect is particularly important in areas that are normally highly reflective, such as the arctic with lots of snow. Once class of aerosol pollution which has had a strong direct and indirect cooling effect are the sulfates. T his is how industrials aerosols cooled the planet down in the 1940 to 1970 period. The effect was strongest in the Northern Hemisphere. In the present period, the effect of sulfates has reversed, because emissions are reducing in Europe and USA in particular. Since sulfates have a very short atmospheric lifetime, this has resulted in falling levels of sulfates, and less cooling -- which is the same as having more warming. In effect, the sulfate aerosols have been counteracting, or masking, the greenhouse effect of well mixed greenhouse gases. As that is removed, the full impact of greenhouse warming is restored. At the same time, there has been increasing emission of black carbon, especially in Asia, from less efficient technologies; like diesel and biomass burning. This has the opposite effect to sulfates, and contributes to warming especially in snowy regions like the Arctic, by increasing surface absorption of solar radiation. This is on top of the reduction in a cooling from weaker sulfate driven reflection effects. For the Arctic, this comes as a double-whammy. None of this is quite as simple as the straightforward effect of greenhouse gases by infrared absorption, which can be calculated as a forcing to high accuracy using fundamental physics. But aerosols have been a focus of a lot of attention over the last decade and more, and papers like Shindell and Faluvegi add to a large body of work that continues to explore the impact of aerosols. These trends are comparable to those of the last 30 years – agreed? Now the case for aerosol cooling seems to be that a huge increase in industrial activity in the NH in the early 1940s not only halted the global warming trend and the, considerably larger, arctic trend but reversed them both. Note the arctic cooled by almost 1 degree between the 1940s and 1970s. Hardly any increase at all. I’ve got the actual numbers somewhere and the emissions trend in the late 1930s and 1940s is flat. The increase in industrial activity began in the mid-1950s, but this was way after the cooling had kicked in. 2. What sort of (sudden) increase in aerosols might produce a long term cooling of this magnitude? Here is the global surface temperature record. Just concentrate on the years just after 1883 and the years just after 1991. Have you figured out why yet? I’m sure you’re well aware that these were the years of the 2 biggest volcanic eruptions in the past 150 years. In 1883, Krakatoa erupted and more recently in 1991 Pinatubo blasted around 20 million tons of sulphur dioxide into the stratosphere, which remained as a layer for several months. You can just make out the dip in temperatures in the early 1990s. Industrial (or tropospheric) aerosols are short-lived in the atmosphere. Most last only a few days, some a few weeks and a tiny minority a few months. They are washed out by rain and snow (remember acid rain?. This is not a problem for stratospheric aerosols. We’ll ignore the fact that the effect of aerosols is “regionally specific” (Mann & Jones), and just wonder how a miniscule ramp up of industrial activity could possibly have a global effect that was significantly greater than that of Pinatubo. In the interests of clarity I’ll leave it at that for now. But suffice to say – I don’t buy it. PS If you choose to reply: Do remember that aerosols are not cumulative. They need constant replenishment to mantain any effect. You cannot simply add the forcing over several years (like CO2). The early aersols ewill be long gone. One thing I consider worth emphasizing -- answers about early this century are more tentative than for recent decades. We simply don't have as much good information, and we don't have a complete picture of climate. So don't take any of this as a confident claim to have all the answers! You speak of the Artic. The first thing to note is the difficulty of getting an accurate trend. The GISS data I have to hand shows 0.559 +/- 0.198; and that is only considering the standard regression confidence bound. The Arctic shows substantial natural variability, which limits the accuracy of trends. There is also an additional uncertainty from measurement uncertainty in individual datapoints, not included in my calculations. All up, the uncertainty here is large. As Shindell and Faluvegi note, natural variation over this time period is a large factor. I don't think we have an answers for the Arctic warming at this time... but it is not outside the range of what is possible for existing knowledge. It's discussed in Shindell and Faluvegi (2009) on page 298; and they are not shy at all about noting what remains uncertain. The Artic does get amplified impact from some of the aerosol effects and how this can occur is discussed in the paper. It's the sort of thing that shows up with a comment of "more work is required" at the end of the paper; but it does not stand at all as a falsification of the basic physics involved. For example, you suggest using CO2 as a proxy for industrial activity. That's totally inadequate. As technology as developed the forms of emissions have changed as well, and there are huge differences between the impact of CO2 and aerosols. You've noted some of them... the short term impact of aerosols is a crucial part of working out their influence. You seem to portray this as a problem. It's actually part of the explanation. Aerosols levels are related directly to emission, not to cumulative emissions, and this is one of the big reasons they tend to give so much more variance from decade to decade, unlike the well mixed gases that accumulate over time. They can have a very strong effect indeed over relatively short time periods. You are right to note that there's limited data on aerosol emissions -- but that's not because there were no emissions! It just means that the levels are less well constrained, and estimated indirectly. The discussion in Shindell and Faluvegi is useful here again, as they discuss some of the possibilities and uncertainties. It's worth noting that the early part of this century had a sharp dip from a number of big volcanoes, and that there is a long recovery time from these. A substantial factor for the early twentieth century is the lull in volcanic activity, after big eruptions like Krakatoa and Novarupta. You mention Krakato. It had a huge cooling impact in all probability... but again, it's a transient. The aerosols wash out of the atmosphere. The time lag for recovery is much longer than the immediate down turn at the eruption, and as the effects wear off, this shows up as a warming effect later on. There's a good discussion on the maths of how this works at Volcanic Lull. You'll see a lot of this discussed in the scientific literature as well; the LACK of volcanoes in the early 20th century is conventionally seen as a significant factor. There may be some solar forcing at this time, as the Sun climbed up to the maximum that we've had in the latter half of the twentieth century. This is hard to measure and estimate. Some people seem to think it has a very large role. I think recent work has indicated the effect is comparatively modest, but it is another part of the warming influence in the early twentieth century. It's a common mistake to think that modern climatology focuses on carbon dioxide for everything. CO2 has certainly become the dominant forcing in the latter half of the twentieth century; which is significant especially because it is so physically straightforward (unlike aerosol effects) and because it is continuing to increase, which means it will continue to be a major factor for some time year. But before 1970, greenhouse effects did not stand out in quite the same way. RE Wolfram on surface integrals. "Perhaps my vector dx notation for a surface element isn't the usual convention"
2) Surface integral of a vector function, in which case the differential surface element "da" is a vector and must be dotted into the vector function. Anonymous... It is the VALUE of the function "f" that is either a vector or a scalar. In either case it ranges over a surface, and so it is given its value (either scalar or vector) depending on the vector a, and the "da" has two parts. Don't think of "da" as a vector, in EITHER case. It is a patch of a surface. Let me be blunt. The IPCC claim that they are able to simulate the climate of the earth over the past century, but (they claim) it is only by including CO2 forcing that they are able to explain the late 20th century warming. This comes from their grandly named "Detection and Attribution Studies". Eli's post includes a wordart graph which, although not originating from an IPCC report(AFIAK), does, nevertheless, represent the general thrust of their argument. I think their claim is nonsense. I don't believe it's even close to being correct. You have done an admirable job of explaining the uncertainties of the various forcings, but this doesn't vindicate the IPCC claims. I notice you do agree with my 1916-45arctic and global trends (not bad as I posted then from memory), but you disagree with my use of CO2 emissions as a proxy for industrial activity. My reason is that, in the absence of other data, it's not unreasonable to assume that a significant increase in industrial activity would be evident in the CO2 emissions record. Thanks for your contributions, but I remain firmly sceptical on this issue. Don't get me wrong. I'm not questioning the use of a single variable (da, dx, dv, or whatever) to represent an element of surface. That's standard practice. If Smith intends dx as a vector, then Wolfram's first surface integral -- the one where da is a scalar -- does not apply and one must use an integral like Wolfram's second one where the element of surface is actually a vector and is dotted it into the vector function f.
but Smith has clearly treated his function f (whose value is T^4) as a scalar. This is what is confusing. Anonymous: Arthur's paper does not work well as a tutorial on surface integrals, and I think Arthur knows this. It is, nevertheless, clear and correct in what he is calculating and how; and it corresponds exactly to what is done in the Wolfram description. Arthur's "dx" is identically the same as the Wolfram "da". Arthur quite properly (IMO) does not waste time on basic calculus or theory of surface integrals. He's simply integrating the scalar T^4 over the surface. And he's doing it correctly with a stock standard surface integral, where T^4 is a function of the location vector x which ranges over the surface. All that is missing for notation is the subscript S on the integration sign to designate surface integral; and this is not particularly unusual or exceptional. They're obviously surface integrals. Arthur does not say "dx" is a vector. The wording "my vector dx notation" refers to the use of a vector x as the integration variable, and of course the "dx" in integration represents a small increment in the integration variable. This increment has one, two and three parts respectively as you are doing line, surface or volume integrals. That is, for a surface integral you can think of "dx" as two vectors... just like the Wolfram page uses two tangent vectors to represent the patch of surface. It is a two-part increment to a vector. The main thing is that with a surface integration, the increment to the integration variable has two components. It's precisely the same if you do a change of variable to use solid angles. Then you might have a surface integral with integration variable dΩ. A solid angle Ω is a scalar quantity, but the dΩ in a surface integral is not simply a scalar solid angle! It has two dimensions or co-ordinates there as well. But we still speak of a small increment (or patch) of solid angle, just like in the vector case the dx is a small increment of the vector x, in two parts. A surface integral adds up patches, and so the dx, or the da, or the dΩ, or whatever you use, will therefore have two parts. Hey oldngrumpy, I don't mind you being blunt. You are welcome to think what you like. Here's why I think your judgments are rather superficial and irrelevant; no offense intended. First, as a matter of clarity, the IPCC doesn't model anything; it is not a research body. Their role is review and assessment of all available scientific literature and information. Many different research groups are applying various physical models to represent climate over the last century. None of these are perfect as yet, but their skill is improving. So it's not clear what "claim" you mean. If you mean a claim to have a full understanding of twentieth century climate -- NO such claim is made, by anyone. What's actually going on is the same as in all active science. There's progress in getting a better understanding as research continues. That's all. I think you have completely missed the point of the globalwarmingart graph. This is not from the IPCC -- it is from one particular experiment reported in the literature. The reason for showing that graph is to demonstrate how to have a meaningful vertical scale. There's a contrast between Kramm's potting of two bits of data on top of one another with no connection whatever between vertical scales, and a graph in which you scale appropriately. You could have taken pretty much any such graph done by credible scientists. None of them have a perfect match as yet; all of them use vertical scales sensibly to see how good the match might be. THAT'S the difference with Kramm's figure combining temperature and CO2. It's not primarily about how good the match is, but about whether there's any meaning at all in the vertical scale. Kramm is just obfuscating. If you really want to look at how good the match is for this particular experiment, it is reported in Meehl et. al. Journal of Climate, Vol 17, #19, Oct 2004, pp. 3721–3727. There's a good summary also provided at the globalwarmingart page on their figure Eli has used here. See Climate Change Attribution. Look at the table provided for the different contributions derived for various for the early, middle and late twentieth century. I'm not sure why they picked out this paper for making a graph. It's a perfectly reasonable choice from a large body of available scientific work, but it's just one experiment and not the most important or influential. Note that the degree of match shown in that graph between model and observation is somewhat representative of the state of progress. The match is fair, but not perfect. You've been asking about the early part of the century; the model here does not quite get as much warming as is observed over this period. You appear to be taking the usual line by people who dismiss the entire field of modern climatology as long as it hasn't answered all the questions perfectly. You inflate the levels of claims being made; in fact the claims of science and of the IPCC are suitably circumspect and entirely reasonable. Our understanding of climate is limited, but improving. It's clear as a bell that greenhouse effects are dominant in the latter part of the century, and the physics for this is really really basic -- the Gerlich and Tscheuschner paper is absolute screaming pseudoscience on a par with young earth creationism. The early part of the century has strong impacts from volcanic forcings and less certain influence from other factors, including the solar forcing and aerosols. The greenhouse impact is present also and reasonably easy to estimate by comparison with other forcings; but back in the early part of the century it is not so dominant. Greenhouse effects really take off in relation to other forcings in the latter half of the century. You are continuing to conflate industry and CO2. That doesn't work. Working scientists recognize that aerosols and CO2 are different, and have different levels of emissions at different times. To use CO2 as a proxy for other emissions is a waste of time; that's not how it is done. In the absence of good emissions data, there are various models used for a sulfate load. For an example of how it is done, see Boucher and Pham (2002) in GRL 29(9), p1308, doi:10.1029/2001GL014048. You can be "skeptical" of that as well... what you are missing is that all the working scientists are already applying proper scientific skepticism, and not making grand claims of perfection where there is real uncertainty. You have to make a balance between legitimate skepticism, and head-in-the-sand refusal to accept anything at all until it's all perfect. Duae - wonderful continuing defense there, I appreciate it! on the "Relativity of Wrong". Comments like your last one are completely irrelevant to whether your mathematical notation is correct or not and add nothing to the conversation. I have no issue with the physics of your paper. Lots of people have done the relevant surface integrals (eg, using spherical coords, for example) and when it comes to that physics, it is completely irrelevant whether your general mathematical notation is standard or correct. But Duae is arguing that your notation is essentially the same as that given by Wolfram and that certainly does not appear to be the case. If x is a location vector (as you appear to have defined it), then dx would generally not be interpreted as a differential element of surface area, no matter what change of variables and coordinate system one uses. generally, if x is a vector, then dx is interpreted either as a vector representing the differential change in that vector or as the magnitude of that change. That's clearly different from a differential surface element. I'm not sure why Duae is so adamant/defensive about this -- or how he can even be so sure that your statement "Perhaps my vector dx notation for a surface element isn't the usual convention" does not mean that dx is a vector. It really is a fairly minor point that (as i said) makes no difference to the physics. I realize kramm might well claim otherwise, but i am certainly not doing so. perhaps Duae feels that if he gives on this minor point about mathematical notation, he has "lost" the argument. Actually, I'm a little surprised at the considerable pushback. And thanks for emphasizing that scientific language is so careful in describing findings and uncertainties. When people claim that published papers make unjustified sweeping and definitive statements about their findings, it's a good sign that they haven't actually read the papers. A surface integral confines the integration to a subspace of the full three-dimensions that 'x' would normally represent - this can be handled either by explicitly representing 'x' in two dimensions (as I do later using angular coordinates) so that you end up with a two-dimensional surface integral, or treating it as a full three-dimensional integration with an appropriate delta-function multiplier that confines you to the subspace of interest. You get the same result either way; the mathematical details are totally irrelevant to the result. Sulfates increased starting c. 1940 because industrial production ramped up swiftly in the wake of World War II. Aerosols increased because there were very few pollution controls. After pollution disasters like Donora in 1948 and London in 1952, pollution controls began to be discussed, and effective ones came about c. 1970 -- and temperature began to pick up again, since more GHGs were being produced, but less sulfates. Warming is greater in the Arctic for a number of reasons. One is the ice-albedo feedback, as another poster mentioned above. Another is that there is less water vapor in colder air, so CO2 plays more of a role in the greenhouse effect in cold areas. Your contention that "aerosols warms in the Arctic" is a little confused. Aerosols can warm or cool depending on circumstances, the most important factors being color and altitude--to simplify greatly, dark aerosols and aerosols low down warm, bright aerosols and aerosols high up cool. The aerosols that have contributed to Arctic warming are dark aerosols, mostly soot, from uncontrolled combution mostly in Asia. There is absolutely no evidence whatsoever that such an increase of anything approaching this scale took place. You're saying industrial production was no greater during World War II than during the Depression? What are you smoking? And can I have some? Anonymous, I'm simply pointing out that what Arthur does with dx is identical to what Wolfram does with da, in all respects. You assert "But Duae is arguing that your notation is essentially the same as that given by Wolfram and that certainly does not appear to be the case." Shrug. I still have no idea what you think is different. It is the same. Arthur explains how it works; the differential element has two components because it's a surface integral. That's true for the Wolfram "da" also, in every respect. I honestly have no idea why you still think there's any difference. I'm not adamant out of any "fear" of giving ground. It's simply that Arthur's notation is standard and identical in every respect to what Wolfram does -- excepting only the omission of the subscript S on the integral sign to help underline that it is a surface integral. That's it. There's no other difference. If you still think there's a difference, I can probably help explain it further. I'm not trying to be aggressive, but I do know about surface integrals. I'm a friendly guy, really! I'll keep explaining how it works as long as anyone is interested. I gave the Wolfram cite because it does the same thing as what Arthur is doing. You appeared at one point to mix up the argument and the return value of the function. T(x,t) is a scalar function of the location vector x and the time. Hence we integrate a scalar function with a vector integration variable, ranging over a surface. That's what is explained in the first part of the Wolfram reference. NASA GISS gives the temperatures for 3 latitude bands. PNNL report gives historical sulfur dioxide emissions. Read details to understand the different estimates, but Figure 3 gives the emissions by region. Dip at end of WW II. Steady climb to a peak around 1975, then Clean Air Acts. Is there any way to get the digital data from that study, rather than a graph? Digital data: I looked when I first found this a year or two back. Steven Smith was the lead author and a serious guy. There is an email form, so I'd try him and see. Let us know,as indeed, a spreadsheet, by year (or whatever), of Figure 3's data, would be a nice thing to have. It of course is interesting to see the obvious effects of the Great Depression and WW II. Merely stating that one "knows about surface integrals" does not mean much (if anything). So does pretty much anyone who has taken basic calculus. How about the surface integral that yields mean global temperature anomaly? It's clear to me that you simply won't admit to being wrong on the small notation point (ie, comparing Smith to Wolfram), so there is no sense in debating it further. I also find it interesting (and more than a little humorous) that you purport to speak for Arthur Smith as if you somehow know more about what he meant by his notation than he does. Anonymous, I habitually read and understand mathematical papers. I don't claim to know more about the notation than the author. I merely understand the bog-standard normal conventions used in maths. What I find pathetic is that YOU claim to know more than Arthur, or me, but want to just declare victory without spelling out whatever difference you think you can see. You've given nothing to backup this claim for Arthur doing something different from conventional surface integrals. There's NO notation difference from the Wolfram reference, apart from using "x" rather than "a" as the integration variable to identify a point on the surface, and omitting the subscript "S" on the integration sign. The only attempt you made to give some spurious difference was in in this comment, where you said "da" was a scalar. You're wrong. The integration variable "a" used in the Wolfram reference can be anything at all that identifies a point on the surface. It could be a vector. It could be a co-ordinate pair. But you WILL need two dimensions. Here's a specific challenge for you. You've made a lot of noise about people refusing to admit errors; some of it borderline insulting. Now you want to continue the same style, without even trying to point out where Arthur's notation is different from the Wolfram page. It's a bit pathetic. Can YOU live up to your own rhetoric? Give it a try. You said "da" was a scalar. You also said you'd done the surface integrals. Have you honestly EVER evaluated a surface integral with one integration variable than is a scalar? HOW, precisely, do you propose to identify a location on a surface with a single scalar??? I'd normally not bother trying to rub someone's nose in a mistake; it's not nice. But if you are just going to claim vague authority, and continue to make rude remarks about why others might fail to fall over and acknowledge your insights, then perhaps you need a little shock therapy. I'll accept a valid correction in a heartbeat; but I'm not impressed at all by yet another person just declaring themselves to be brilliant and running away. If you can raise your level to specifics, then progress is actually possible. Progress will mean someone at least learns something. It's now up to you to actually describe this putative difference between Arthur's surface integrals and the standard definitions I have cited. If you try, and fail, I'll actually think a LOT higher of you for having the capacity to learn something. The above is just "pulling a Kramm". You can be better than that. Are you up to it? I agree with Natasha, Joel. Calling this technique "Watch Natasha Naked!" is a pithy and completely apt description. I am going to add it to the urban dictionary. A report from the future: Kramm's wiki page has--summinabeeotch! !- been made to disappear...poofta. Guys who piss Eli off tend to do that.